Santorini: where your heart always will be! Santorini is a dreamy destination for people from all over the world. The locals say that the island has a heart that beats loudly, sending out vibrations. The people’s heart either synchronises with the island’s one and they end up staying there, or they never couple with each other and leave the island as fast as they can, or so the legend goes. Did you know that the name Santorini was given in 1153 by the Venetians? It is a pronunciation of both words Santa and Irene (Saint Irene), taken from the name of the church in the valley of Therassia, or perhaps from the name of the early Christian basilica in Perissa. Visit the Museum of prehistoric Thira, with exhibits from the Neolithic period, right up to the destruction of the Minoan civilisation. Imerovigli was developed on the edge of the cliff along the Caldera, at its highest point, so it offers really impressive view to the volcano. Do not miss Oia’s breathtaking sunset. 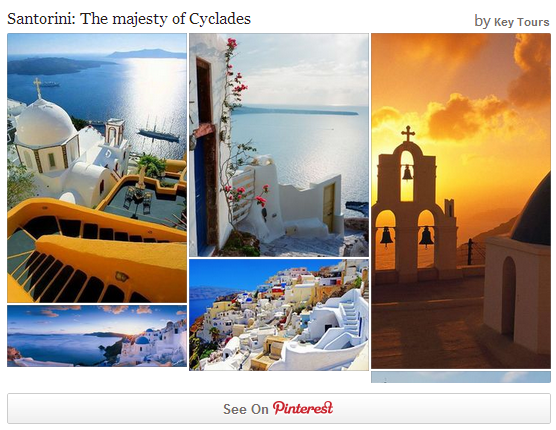 Oia is the most romantic destination. It is famous all over the world for its magnificent sunset, which visitors can enjoy from the Goulas (watch tower) of Aghios (St) Nikolaos castle. The sunset light adds more colours to the scene and you will have the feeling that you are sailing across the centre of the crater. You may do this tour by private boat, or choose one of the organized sea excursions. 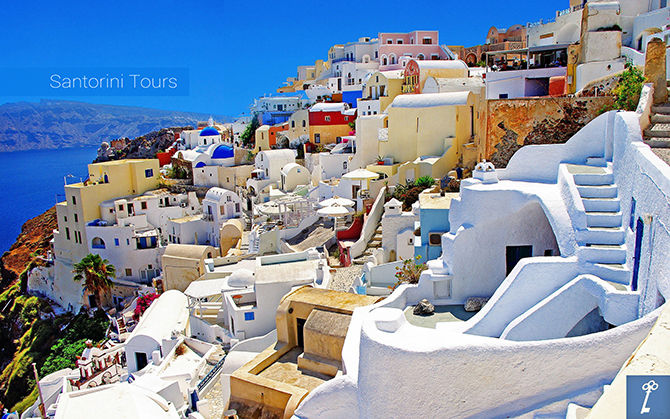 Discover Thira! The view from up there is amazing. Admired from the inside of the Caldera, its views of Santorini are incredible. Even if you arrive on the island by ferry or cruise ship in the afternoon, this awe-inspiring land will leave you speechless. Tip: the walk from Fira to Firostefani through the old cobblestone path is the best way to visit this picturesque settlement, enjoying the magnificent view. A must day cruise is to visit Palaia & Nea Kameni. Sailing around Palia Kameni, you will see coves where you can take a swim. Blue waters are warm and therapeutic. The rocks have unique shade of yellow, orange and brown. In Aghios Nikolaos in Palia Kameni, you can enjoy the thermal sulphur baths. When in Santorini you should taste local products. The products of the volcanic soil are delicious. Try the dry cherry tomato, called anydro (waterless), fava (split peas), caper, white eggplant, katsouni (a kind of small cucumber), and dishes from the traditional cuisine - such as tomato balls (pseftokeftedes). Santorini will be an unforgettable destination for everyone who visits the island not only first time, but also for returning visitors who fell in love with the island. Book online your ticket to this paradise!